Also known as “fruit sugar”, fructose is roughly 50% sweeter than ordinary sugar, tastes wonderful, and does not raise blood sugar levels like table sugar. When taken in moderation, fructose can be taken by diabetics after first consulting with their physician. Crystalline Fructose is a natural sweetener derived from corn and is approximately 50% sweeter than regular table sugar (sucrose). However, you will need to experiment a little in order to determine the exact amount of Fructose to substitute for table sugar in a recipe. In general, if a recipe calls for 1 cup of sugar, a little over 2/3 cup of Fructose should be equivalent, but sweetening to taste will yield the best results. Fructose also provides the additional benefit of having fewer calories than table sugar to achieve similar levels of sweetness, because you can use less fructose. Since a smaller volume of fructose than sugar would be needed in a recipe, you may have to increase the dry ingredients proportionally to compensate. 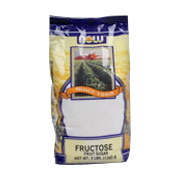 Fructose is shipped in a discrete, unmarked package. Orders are processed immediately and usually take about 3 to 5 working days to be received. Any information received is used only for order processing and shipping purposes. Your information, such as e-mail address, will never be disclosed to a third party.